For new and less experienced shooters seeking firearms training in the areas of fundamental marksmanship, firearm manipulation, ammunition basics, standard malfunctions, and safe weapons handling. This firearms training class is best thought of as as everything your shooting friends and family members forgot to teach you growing up. In this shooting class instructors teach the basic knowledge skills and attitude necessary for owning and using a pistol safely. This program also satisfies the Virginia State Conceal Carry Requirements (CCW). The course begins with an entry level pistol shooting education class taught by NRA Certified Instructors in the Arlington, Virginia area. 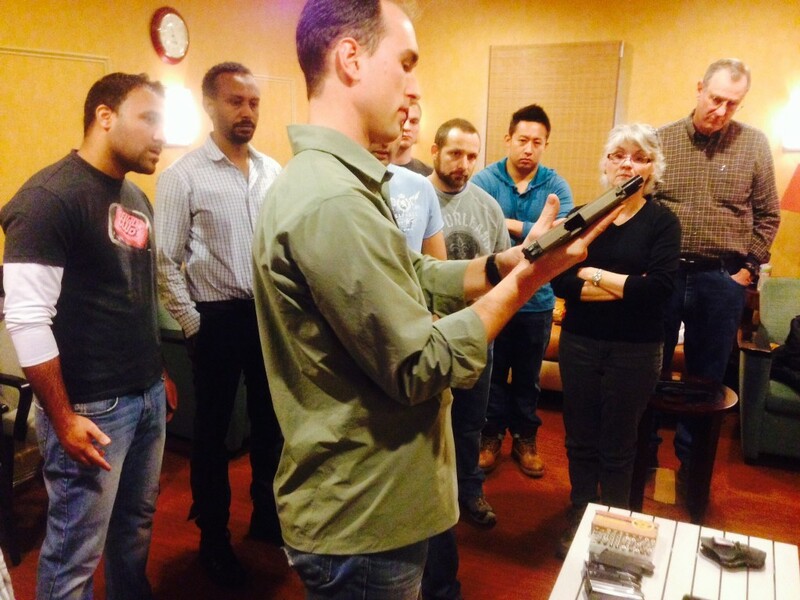 Included in the entry level education and pistol orientation course is a thorough hands on firearm manipulation session overseen by qualified firearms instructors. Lastly in class we provide an introductory lecture on armed self defense and concealed carry in the State of Virginia. The same day or a night or two later, National Shooters Instructors meet with students at the NRA Range in Fairfax, Va for one (1) hour of live fire shooting. Instructors will walk students through proper range etiquette, safe weapons handling, and shooting conduct. If students are taking this course to purchase there first handgun be sure to check out our Handgun Sampler as an additional service combined with this program. Comfortable clothing during our classroom portion, avoid low cut shirts, and uncomfortable shoes during shooting sessions. Instructor Lindsey teaching basic shooting skills at the NRA Range in Fairfax, Virginia. Basic handgun skills require live fire.